Over the course of the last two, or even three decades, I can think of only two comic book series that people would comment on or reflect upon. One of those was Watchmen, the other, Sandman. In many ways, I believe Sandman helped propel creator/author Neil Gaiman to some prominence (though his talent is such that if it weren’t for Sandman, he still would have gone on to fame [and hopefully fortune]). 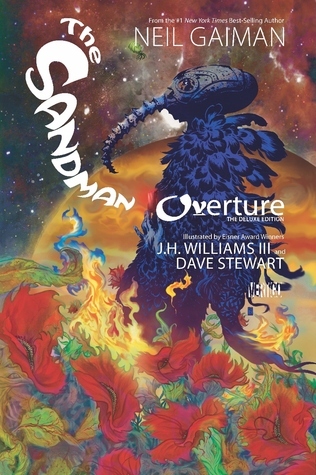 Sandman: Overture, is in part a prelude to the entire series, but it is more than just a book to fill in some blanks or to answer some questions that arose during the comics publication. It is a prelude, an ending, and eternity. Which is a massive scope, of course. But the story is also very personal and tight, with Morpheus (one of the seven “Endless”), Dream (as cat), and a young girl waxing reflective. It is not easy to tell a story that is epic and eternal but also small and intimate, but Neil Gaiman is one of the few writers alive who can tell a story this way and do it so well. Gaiman weaves a story that is complex and beautiful. It takes some attention to read this – this is not a straightforward superhero story. This is the land of dreams and nightmares and as such, it is as fantastical as our own dreams. As a straightforward, written story, this would be fascinating. But this is much more than that. JH Williams III contributes to this story immensely with art that is tremendously fantastical and fantastic. This book is a real treasure for the eyes and is as complex to see as Gaiman’s writing is to read. You must be prepared to swivel and turn this book in order to fully appreciate the eye-gasm here. And contributing to this visual are both the lettering and the coloring (Todd Klein and Dave Stewart, respectively) which are also wildly complex. This edition includes a series of interviews with the creative artists as they explain their processes. Klein’s work, not only here but throughout the Sandman series, has been full of invention and innovation. I may be as impressed with the fact that he created over 50 different character and caption styles for the books as with the story itself. Stewart’s work is no less impressive. One need only look at the cover, as pictured above, to see the amount of detail and work that has gone into the artwork, including the coloring of this. And while too often in comics the cover is truly representative of the art inside, in this case it is very much in line with what we see. You can judge this book by its cover. Whether you’re new to this series, or a long-time fan, there is much to love here. If you’re new, this will make you want to go on and binge read the whole series. If you’re already a fan, this is a glorious gift from Gaiman and company. Looking for a good book? The Sandman: Overture is a graphic novel unlike any other, with story and art that are sublime. I received a digital copy of this book from the publisher, through Netgalley and Edelweiss, in exchange for an honest review. ← THE BEST SCIENCE FICTION AND FANTASY OF THE YEAR, VOLUME NINE – Jonathan Strahan, ed.